I held a hummingbird in my hand today. To hold such a tiny, beautiful creature was thrilling. It was as if time had stopped in my hand. 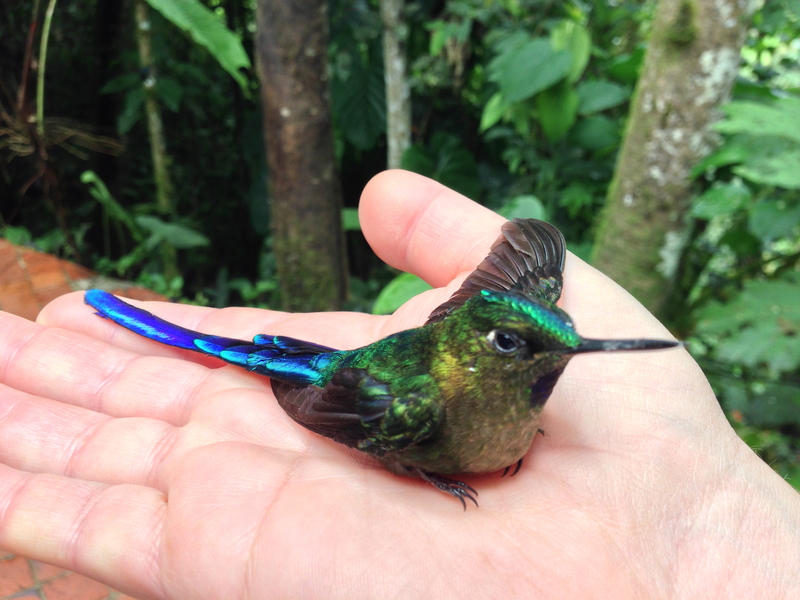 There were over a hundred other hummingbirds zipping past my head on the patio of Tandayapa Lodge in the Ecuador Andes Mountain range, but this one—this Violet-tailed Sylph—was silently resting in my palm. In this moment I felt powerful enough to stop everything around me, as if I were Moses about ready to part the Red Sea. I stopped time with this sweet little bird that zips around all day, yet instead of zipping around, he was still and sitting in my hand. As I held the bright blue and violet bird he was panting and breathing fast. He was stunned because he just flew into a window. He stopped to catch his breath and let me hold him as he rested. He was confused and kept looking up at me, probably scared. While I cradled him in my hand I wondered how long he would rest there before flying away. I wondered how long before he would die. It was all my fault. I left the door open at the lodge and he apparently flew in. I suppose that in trying to get out he must have thought the big glass paned window was the pathway to his world outside. My eyes welled up as I looked into his. I think I’ve killed this little bird by my carelessness. Sure he will fly off but it’s just a matter of time before his little body will give in to the blow. I can’t take back what I’ve done. 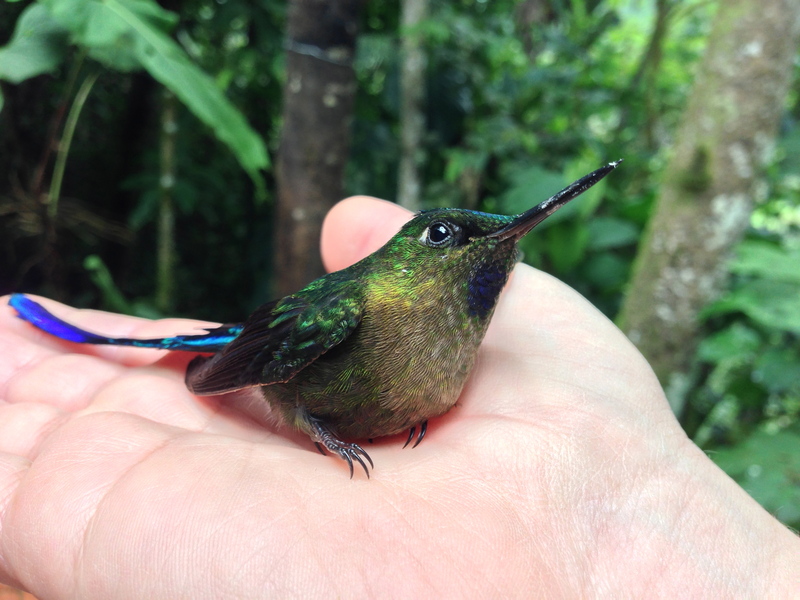 There’s no power in holding a hummingbird, really. After five minutes of him looking at me and me looking at him he flew off and rested on the wrought iron railing, still panting. 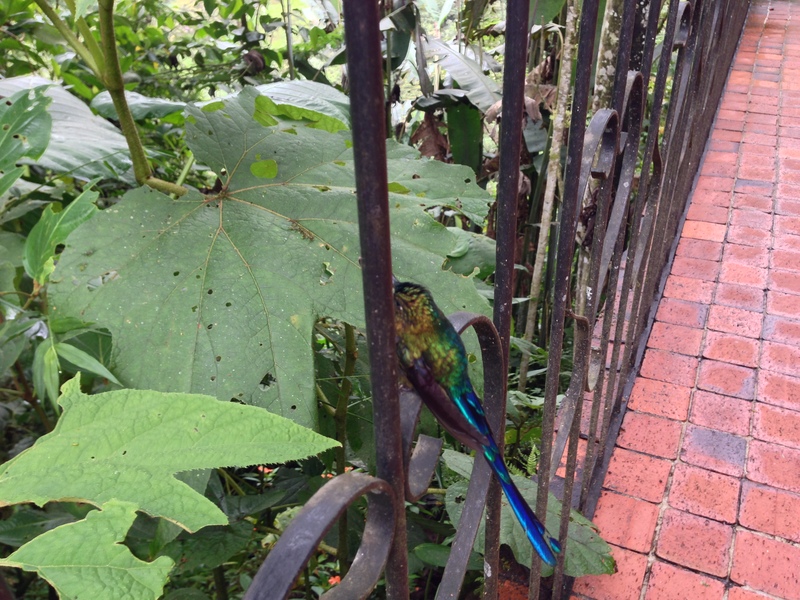 He struggled a few times to fly to a gigantic leaf nearby and then flew back to the railing for more secure footing. This happened three times and then he flew away. I hope he is okay. I want him to be okay. Wow, awesome. But also scary. That happens to us, too – a bird flying into the glass – from outside, seeing the reflection of the garden. I think usually, they’re ok because they’re so light. And what an experience for you. Thank you for your note Greta. That makes me feel better if you think he should be okay. I really hope so. I was hoping you would go to tandayapa it is so wonderful to have a cup of coffee and have 2o species of Hummers in view. We have big windows in our house , when an oriole crashed and died we put stands of fishing line in front of the windows so we would not go through that trauma again.hummers are tough so he is probably fine. I meant strands of fishing line. I really enjoy your postings .have fun!!! Hi Pat! Fishing line is a good idea! I hope the hummer is doing fine as well. Poor guy. Wow, what a beautiful bird! I’m glad he is ok. Hope to see more new bird pics from you. Lynn, more pictures are definitely coming! Because we’ve been mostly in remote areas we’ve been without wifi. You’ll see more photos and stories over the next several weeks. You can count on it! We had a Ruby-throated Hummingbird get stunned by a window strike on our deck. And a Blue Bunting, too. But they both flew off after recovering. I’m sure yours is fine. Not to worry. Those little hummers are something! Bluebird Annie, thanks so much for your note and assurance that the little hummer will likely be okay. All the comments here have helped me with this little tragedy. This is amazing. What an incredibly delicate creature. Lovely photos and story! Thank you Sophie! Glad you dropped by. I’m sure he will be okay – probably just a bit stunned. The experience and photos are fantastic. One day, I found a hummingbird tangled up in a spider’s web. The birds couldn’t move. Luckily the spider wasn’t around. I took me awhile to get the sticky spider web off of the hummingbird. The hummingbird just laid in my hands the whole time, staring at me, totally still. I thought it was going to die. After I got all of the sticky mess removed, I laid the bird out on the warm grass on the grass and watched. It still didn’t move. Then suddenly, it flew off in the blink of an eye. The next day, I was standing in my bedroom (on the second floor), and I heard a tapping sound on the window. It sounded like someone was throwing pebbles at the glass. So I opened the curtains to see. To my surprise, there was a hummingbird hovering right there. I had never seen a hummingbird up so high before. Was it the same one? Did it come to say thanks? I don’t know. It tapped the window one more time and then zoomed away. Amazing story. I love it! What a great story! Have you heard of “The Bluebird Effect?” You can buy it on Amazon. (Also an e-reader version is available–that’s the one I have.) Wonderful stories about bird behavior just like what you wrote about above. Thank you so much for sharing! Fabulous! What a rare and wonderful treat. Thanks Sue! I think this story will stat with me the rest of my life. So will the lesson. Zest, thanks so much. I think the comments here have bee re-assuring. Yes, it is a bit of a shame, the whole incident, but a wonderful life lesson too. What a beautiful bird! That tail is something else. How lucky you were to be able to hold it. (even though it hit the glass) When we were in Costa Rica we found a bird that had died due to a window strike at our lodge. It was a beautiful euphonia. The preserve popped it in the freezer and then sent if off to the museum to use as a specimen. Gayle, that’s neat that the bird was sent to a museum. Makes me feel a little better when that happens. In my neighborhood at home, if that were to happen it would just end up being lunch for a magpie. You write so well! 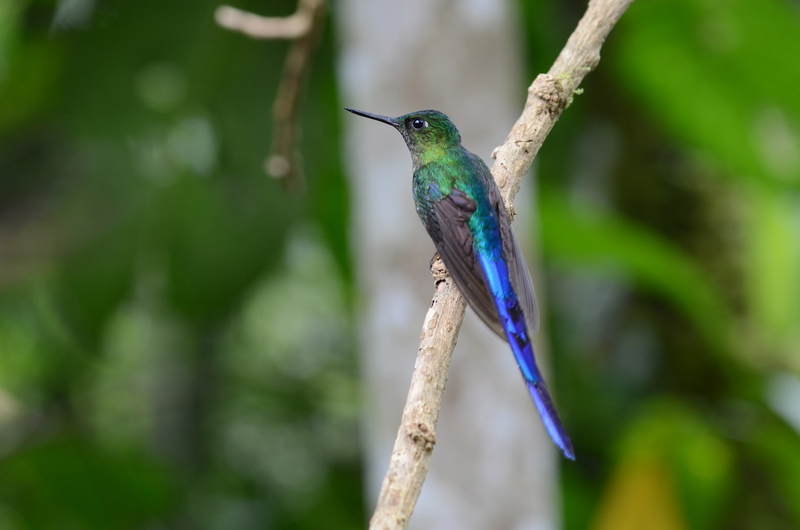 And that last photo – well, they’re all great, and for you, the ones of the hummer in hand must be best – but oh, the iridescence on the last one. I believe it’s a privilege to hold a wild bird in your hand. I’ve hand tamed chickadees, and it’s just a moment of speechlessness, when they alight on your outstretched palm. I rescued a sapsucker from a NYC park may years ago. It too was stunned, for hours, but I knew what to do – keep it warm in a dark, quiet place – and sure enough, it recovered and flew off. I think this happens very frequently. You had a gift, and the hummer is probably fine. Thanks Cath! Let’s hope so!